With this guide you can learn how to use a leading converter SoundTaxi on your Mac computer. Do not settle for a subpar converter, if you can have a full featured SoundTaxi on a Mac with just a little of set up work. Recent versions of Mac OS include the Boot Camp feature, which allows users to dual boot a complete Windows OS and a Mac OS on a Mac computer. Once you set up Boot Camp, you can run SoundTaxi inside Windows on a Mac just as you would on a PC. 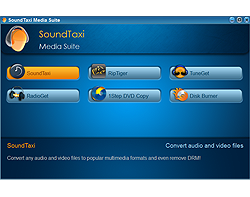 Install SoundTaxi and iTunes inside Windows and you are good to go. Note: The benefits of Boot Camp include being able to use a complete Windows installation on your Mac and the ability to run other Windows software. Also, Boot Camp is officially supported by Apple, hence the availability of official technical support. There is a variety of third party software that allows you to use Windows applications on a Mac via "emulation" methods. Parallels seems to be the easiest option with the most flexibility. Please, refer to the product's official web-site mentioned above for instructions on using Windows software with a Mac computer. Note: SoundTaxi isn't affiliated nor does it develop or support "VMWare" / "Parallels Dekstop" products. If you need information or technical support while using this software, please refer to the vendor's official web-sites. In case you haven't found the answer, please send your detailed problem description to support@soundtaxi.info. Please provide as much information as you can and we will assist you as quick as it's possible.